Sound designer Walter Trarbach and Foley artist Mike Dobson tell us how they created the sound world for this unique musical adaptation of a hit cartoon. It’s hard to believe that SpongeBob SquarePants has been bobbing up and down in Bikini Bottom since 1996. 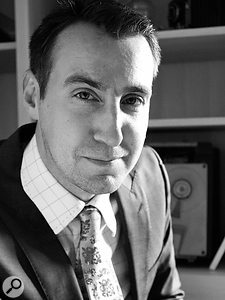 The cartoon character created by marine biologist and animator Stephen Hillenburg, which came from an unpublished book and metamorphosed into a massive hit TV series for Nickelodeon, has long since passed the point where it can be described as a media phenomenon. It is claimed that the franchise has generated $13 billion in merchandising revenue alone for Nickelodeon, and is the company’s highest-rated series ever. 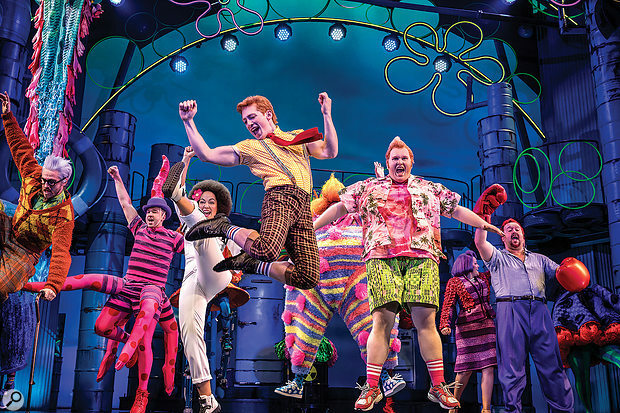 Which is all very well, but not of primary interest to us until SpongeBob SquarePants: The Broadway Musical hit the stage in 2017, at which point what was otherwise an amusing TV kids’ cartoon series strayed very much into our area with some ground-breaking sound design and, curiously, a very 21st Century take on one of the oldest theatrical professions: Foley artist. If the cartoon series, which was first screened in 1999, was a media sensation, the musical version has been no lesser event. Initially staged in Chicago, it arrived on Broadway last year and earned 12 Tony award nominations and endless praise from the critics. 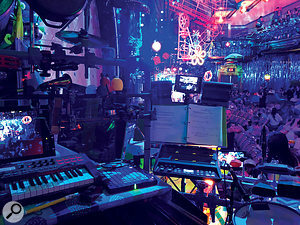 Notable was the nomination for best sound design of a musical, which put Walter Trarbach and Mike Dobson, the show’s sound and live Foley designers, respectively, in the frame. There are, as you might expect, many unusual things about the musical SpongeBob, including a tap-dancing, clarinet-playing squid (with all the attendant audio problems that presents). For a start, this was by no means the sort of show that was knocked together in a rehearsal hall in six months. 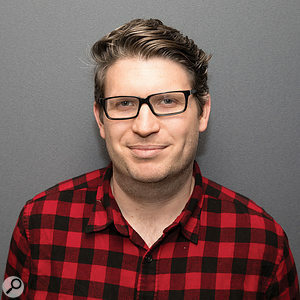 Walter Trarbach and Mike Dobson began work on it six years ago, even before there was a script and before most of the songs were written (contributed by an array of star writers, including the likes of David Bowie, Plain White T’s, Panic! At The Disco, Cyndi Lauper, Yolanda Adams, the Flaming Lips, Aerosmith’s Steven Tyler and Joe Perry, and They Might Be Giants). 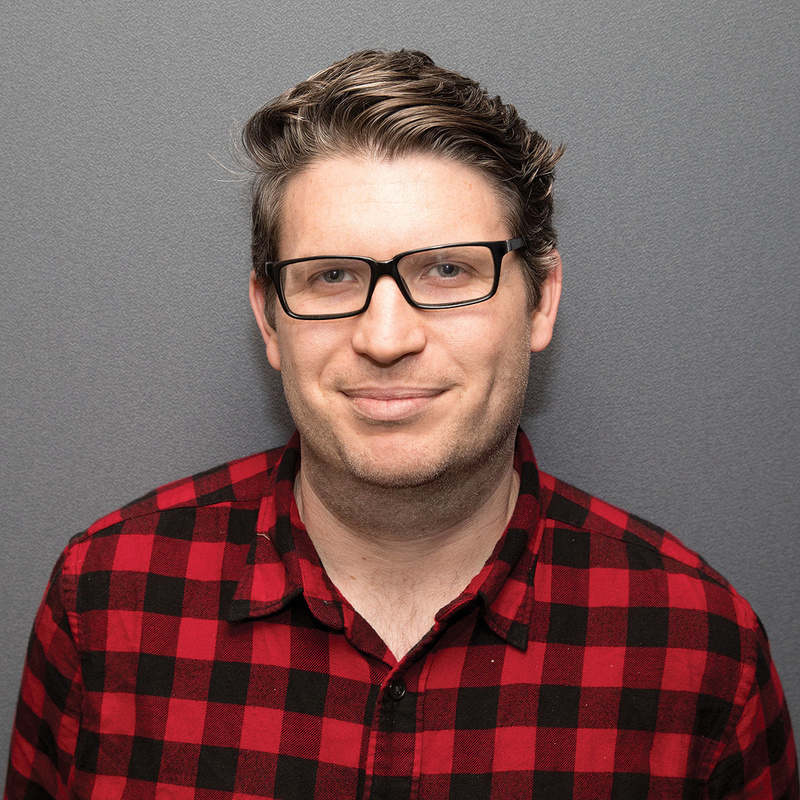 They didn’t just start at the very beginning of the creative process, they also worked together much more closely than a sound designer and a Foley artist might usually do, creating and evolving sounds as the show was being fashioned. The SpongeBob audience doesn’t just have to hear the artists and the band but has to be very aware of the sound effects, too: being based on an animated cartoon there are lots of them and they are an integral part of the show experience. Imagine creaking footsteps as SpongeBob crosses the stage, bubbling volcanoes, boulders rolling around the sea bed and plenty of explosions. It’s a Foley artist’s dream. Or nightmare, come to that. Mike Dobson isn’t one of those Foley artists who hides at the side of the stage. 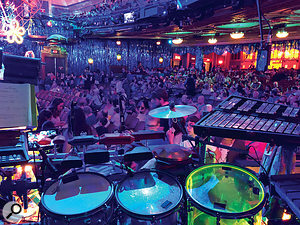 He is an integral part of the show, playing drums in the band with his full kit as well as providing sound effects from an array of props in full view of the audience. 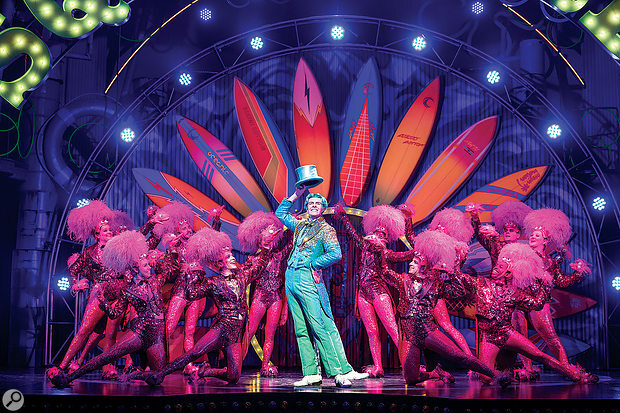 Dobson has to follow the action as it takes place (which isn’t always directly on stage), including interacting with SpongeBob at one point in the show, and timing his array of special effects to the performers’ actual movements — quite literally footstep by footstep. As you might expect, given the subject matter and the length of time they’ve been working together, Mike and Walter are almost a double act in themselves. 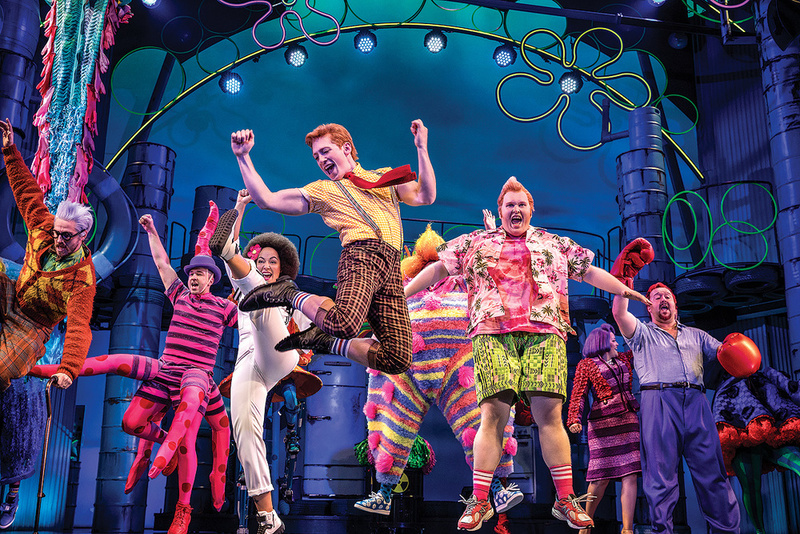 So how did they get involved in the SpongeBob musical project? But how did Mike get into being a Foley artist? It’s an idiosyncratic role, but as you’d expect, it involved a lot of traditional musical training. Given the brief — to interpret an animated cartoon, with all the craziness that suggests, on a theatrical stage — what problems have the duo had to face? 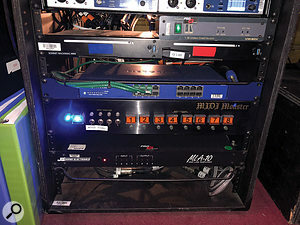 Two DiGiCo consoles — an SD7 and an SD10 sidecar — are chained together to handle the 200+ channels that the show requires. 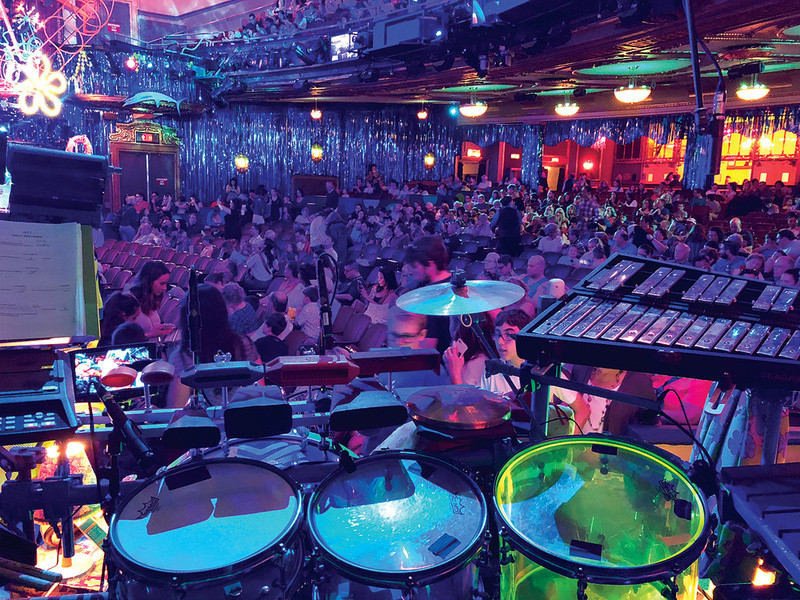 Mixing a live band is one thing but a theatrical performance — especially one so dependent on special effects, with infinite potential for timing changes and pratfalls (both literal and metaphorical) — calls for extreme adaptability and great watchfulness. There’s no way the show can be put on a memory stick and left more or less on autopilot. One of the star performances of the show is a tap-dancing squid, Squidward Q Tentacles. Not only is he tap dancing with four legs, but he is also supposed to be playing the clarinet. Only (spoiler alert!) that last bit is faked — but the tap dancing isn’t, and calls for not only considerable skill on the part of the actor, Gavin Lee, but on behalf of the sound team, too. How do they handle tap activity like that? 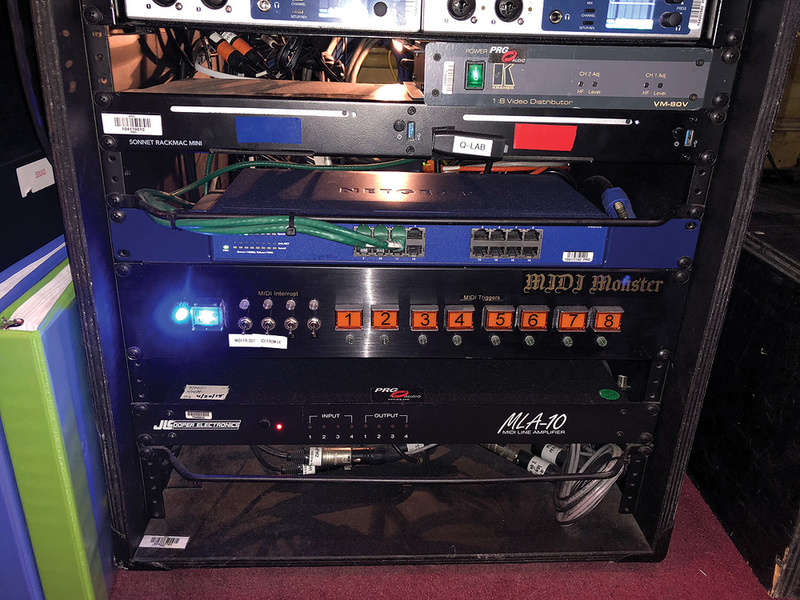 One advantage that handling sound design for a theatre offers is that it is at a fixed location, unlike touring with a band, where venues can differ significantly one from another. But you do, it turns out, have to start from scratch, just as you would if touring. In addition to his Foley duties, Mike Dobson is also the percussionist for the show’s 18-piece band.Mike Dobson’s array of sound-effect-generating equipment maintains the fabulous tradition of movie and theatrical Foley artists using found objects to generate sounds for which they were never intended. So what exactly is he using? “It’s a combination of traditional percussion instruments — things that provide the normal kind of cartoon Foley palette like cow bells and wood blocks and drums — and then a lot of other cartoony sounds like slide whistles and car horns and squeaky dog toys, plus a lot of found objects and garbage and pieces of metal that sound cool. 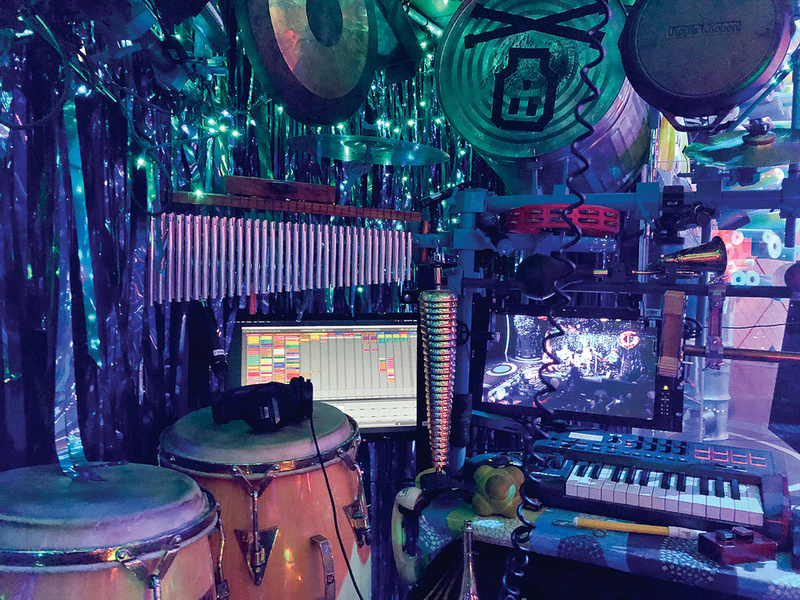 I have this great trash can that I tortured Walter into putting a beautiful microphone on, and there’s a frying pan — the DIY recycled garbage aesthetic that you see throughout the show is also in the instruments,” he laughs. I should probably add here that for readers who aren’t familiar with the SpongeBob story, it takes place under the ocean and SpongeBob himself lives in a pineapple shell, so there are a lot of the sorts of things you would expect to find on the sea bed, like wooden planks, discarded ropes and just general junk. These all figure in the set as well as in Mike Dobson’s Foley kit. Not all the sound effects are generated by hitting pieces of wood and metal or squeezing a rubber toy at the right moment — electronic sources, of course, have a big roll to play, as Dobson explains: “I do a lot of the electronic sound effects in Ableton Live, where I’m using a Novation Launchpad and keyboards to trigger things in Ableton. We basically do all the plug-ins and bounce them down so we’re not running too many plug-ins live. Mostly it’s just functioning as a very high-powered sampler. It’s just set up so that when I push ‘this’ it’s ‘this’ footstep and when I push ‘that’ it’s ‘that’ footstep. For the keyboard, Walter created this very cool thing where it’s mapped across the stage, so as I move up and down this little two-octave keyboard that provides the sounds for SpongeBob’s steps, it moves across the stage with him, so I can follow him from left to right. “I, on the other hand, have never made a mistake,” Walter adds, deadpan. As with the panning effect of the footsteps-generating keyboard, solutions have had to be found to specific unusual problems (tap-dancing squids aside), as Dobson explains. 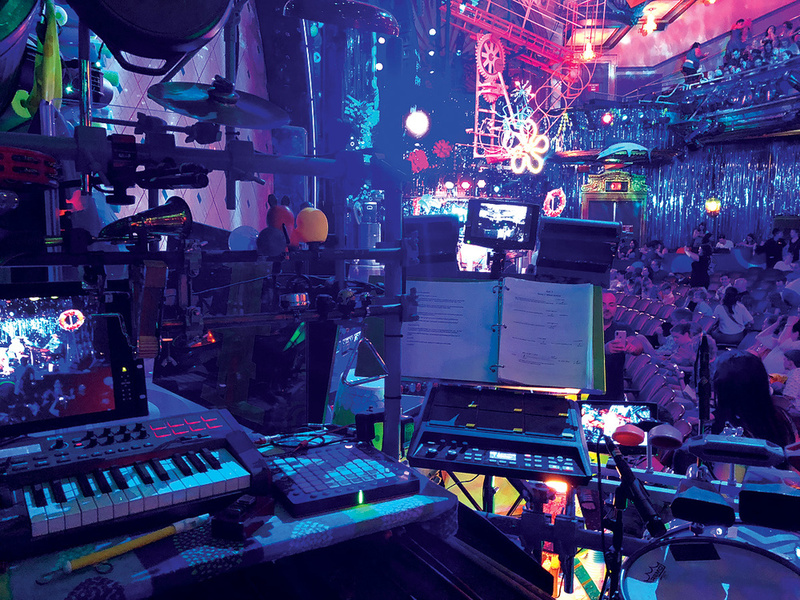 “Walter had to solve the problem of interfaces on these contemporary USB-based devices going into a redundant system that you need for theatre, and he had a box built to act as an interface. At the recent Tony awards ceremony in June, SpongeBob didn’t manage to capitalise on most of its nominations (it had tied with Mean Girls, with 12 nominations each). Instead, The Band’s Visit scooped most of the musical awards but, still, nominations are nominations and the show, as they say, goes on — and, we can assume, on and on after that. So far there has been no suggestion of a transfer across the Atlantic yet, but surely London’s West End needs a tap-dancing squid?